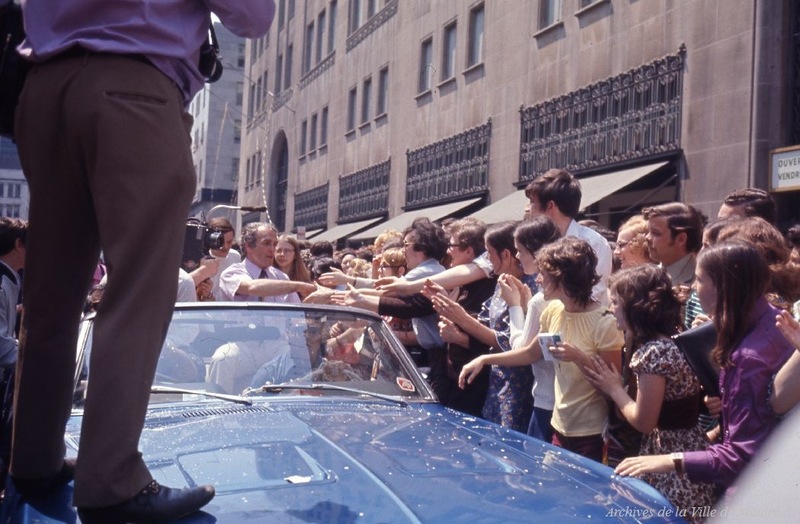 He’ll be missed — oh, baby, will he. Bob Cole takes one last turn behind the play-by-play mic on Hockey Night In Canada: the inimitable 85-year-old Newfoundlander is hanging up his broadcasting booth after 50 years on the job. His final game goes tonight at Montreal’s Bell Centre when the Canadiens host the Toronto Maple Leafs. 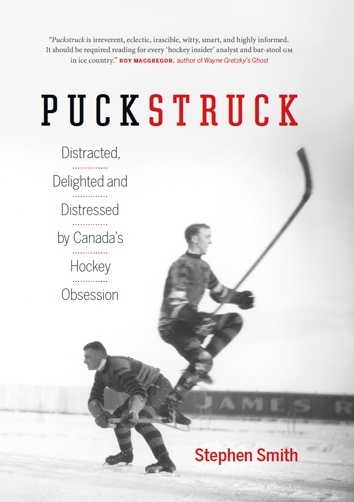 His first fell on a Thursday, April 24, 1969, when Montreal beat the hometown Boston Bruins 2-1 in double overtime. Jean Béliveau scored the winner (the only overtime goal of his career) to wrap-up the Stanley Cup semi-final in six games. If you’re in the mood for appreciations of Cole’s work, Sean McIndoe’s tribute at The Athletic from earlier this week is worth your time (you do have to be subscriber). Dave Stubbs has a good interview with the man himself, too, over here. Oh baby! What a career! 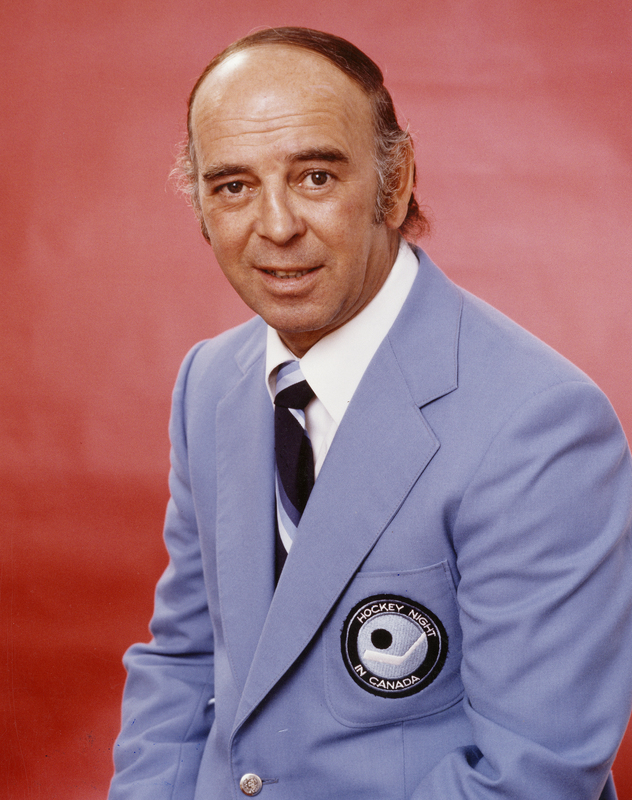 Bob Cole will call the final play-by-play of his half-century career tonight. 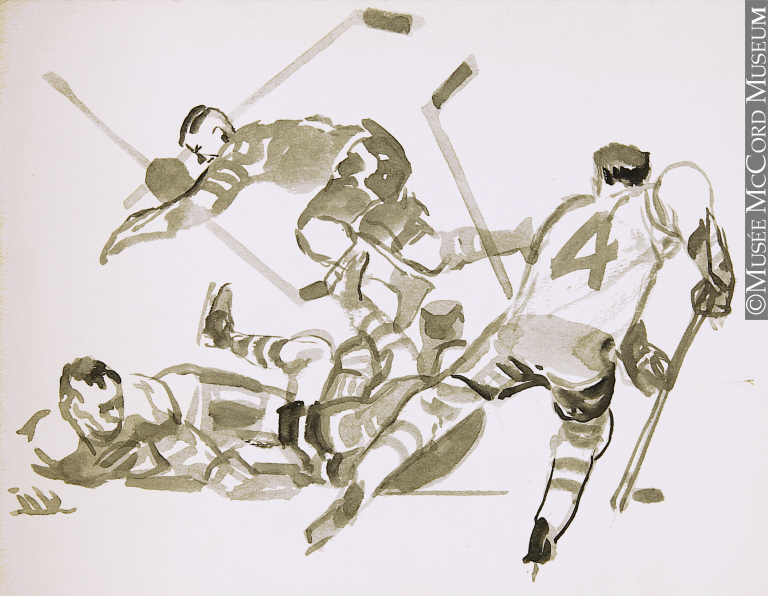 Grace, Too: “Hockey game with Jean Béliveau” (1965), Duncan Macpherson. Wash on card. © McCord Museum. Le Démon Blond: “The class of hockey,” winger Wayne Cashman of the Boston Bruins called Montreal’s Guy Lafleur in the late 1970s, when the two teams weren’t exactly kindred spirits. 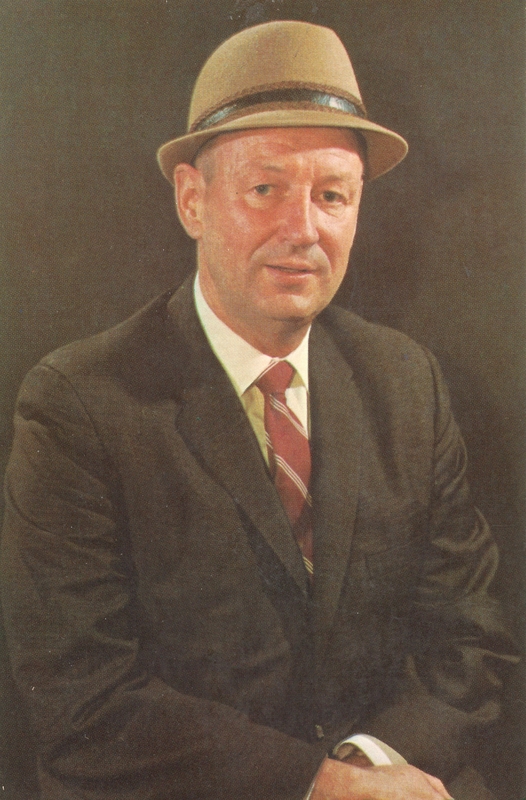 “Guy Lafleur is Guy Lafleur,” added Bruins’ coach Don Cherry, around that same time: “the greatest hockey player in the world today, bar none.” Anything to add, other Bruins’ winger John Wensink? “Guy Lafleur better have eyes in the back of his head, because I’m going to cut his ears off,” Wensink offered after a particularly spiteful encounter between the two teams in the playoffs for the 1977 Stanley Cup. Lafleur was supposed to have aimed a slapshot at the Bruins’ Mike Milbury and … but no. Whatever he did or didn’t do back then, on Lafleur’s birthday, let’s stick with the superlatives. 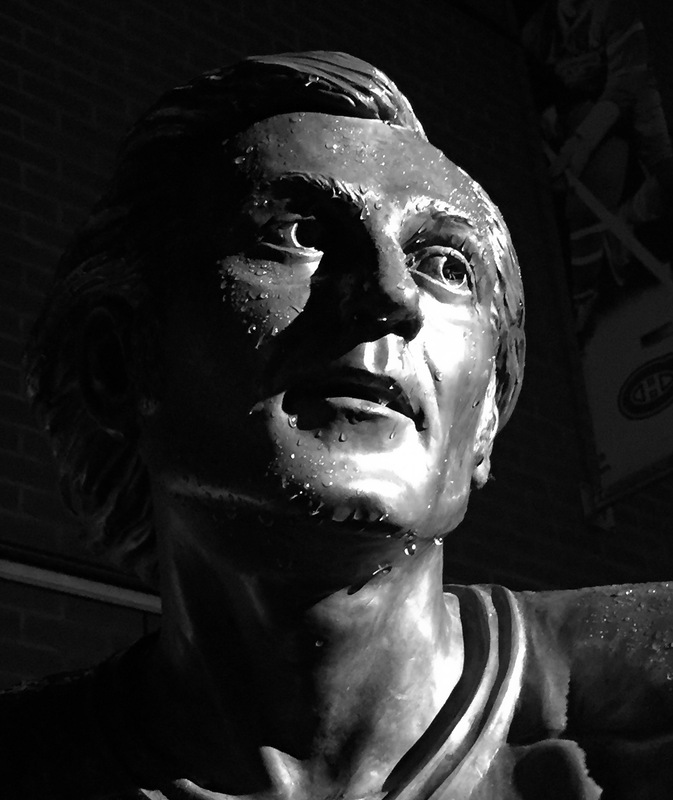 “Quick, decisive, confident,” is what teammate Ken Dryden wrote of Thurso, Quebec’s own Flower, who turns now 67; “ever threatening, his jersey rippling, his hair streaming back the way no one else’s hair did.” That’s Lafleur’s statue above, photographed one November evening out where it guards the approaches to Montreal’s Bell Centre, on permanent duty with his fellow tricolore titans, Howie Morenz, Maurice Richard, and Jean Béliveau. Boston’s surging Bruins play in Montreal tonight, where (in case you hadn’t heard) their old rivals the Canadiens continue their season of struggles. The two teams meet again next Wednesday before returning to Montreal to complete their mini-series a week from tonight. The two teams have played 34 playoff series against one another since 1929, with Montreal having prevailed in 25 of those. Tonight’s game is the 739th regular-season meeting. Canadiens are ahead by (almost) a century on that count, with a won-lost-lost in overtime record 360-267-8 and 103 ties. The first time the teams clashed was December 8, 1924, a Monday night, in Boston. That was the first year there were Bruins, of course, and in just the third game of their history, Canadiens spoiled the evening by beating them 4-3. 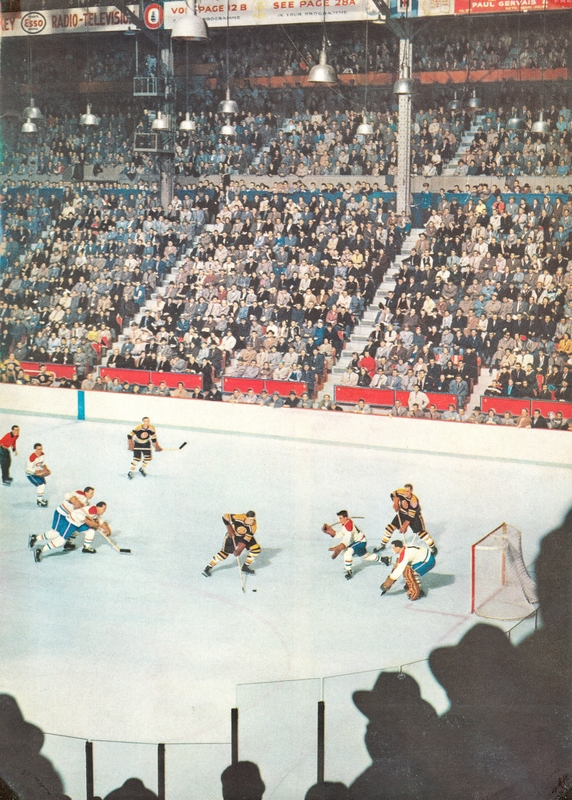 The ice was a little soft at the Boston Arena; the crowd numbered 5,000. Aurèle Joliat notched a hattrick for the defending Stanley Cup champions from Montreal, with Howie Morenz adding a goal of his own. Scoring for Boston was Bobby Rowe and Carson Cooper, with a pair. 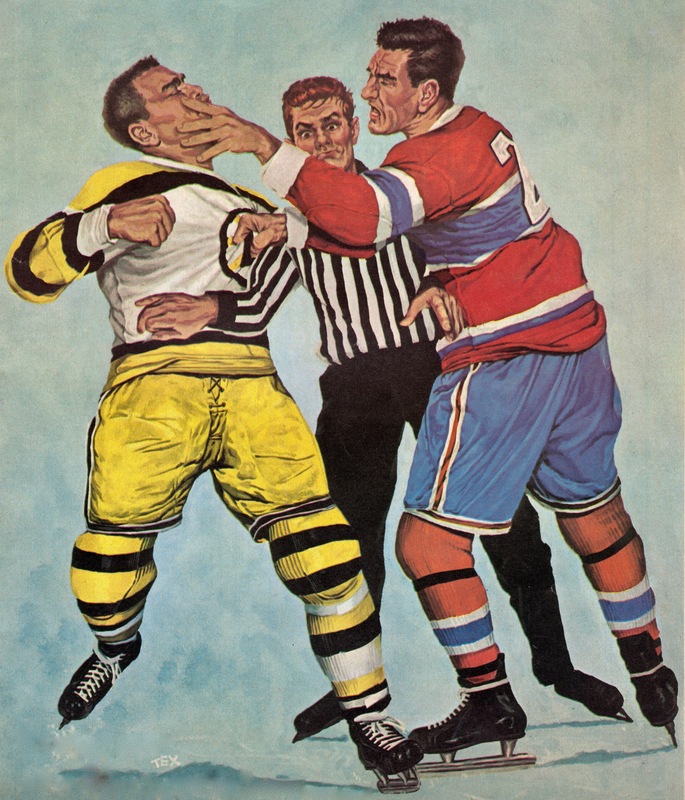 Is it fair to say that Tex Coulter caught the spirit of the rivalry in his 1959 painting of a couple of belligerents ignoring the referee? That’s one question. Another: who were his models? Fern Flaman and Leo Boivin were up atop the pile of leading Bruin penalty-takers that season, but Coulter’s Bostonian doesn’t look like either of them, to me. The haircut kind of suggests Jack Bionda. The Hab in question is numbered 2, which would make him Doug Harvey. I don’t see that, though, either. Could be 20, I guess, which was Phil Goyette. Ian Cushenan was 21 and Don Marshall 22 and … I don’t know. Safe to say it’s not Jean Béliveau. Let’s just leave it there. Game’s on.